Nuclear medicine is a diagnostic and therapeutic medical subspecialty that focuses on the use of radiopharmaceuticals for measuring in vivo molecular biology and for identifying and quantifying functional and molecular pathophysiology associated with a variety of disease processes. Molecules labeled with radionuclides—termed radiopharmaceuticals or radiotracers—are a fundamental component of the specialty. As such, radiopharmaceutical chemistry is a key discipline for nuclear medicine. 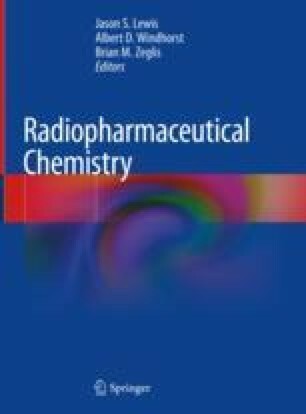 This introductory chapter describes the fundamental principles of nuclear medicine, reviews the current and future applications of nuclear imaging and targeted radiotherapy, contrasts nuclear medicine with other approaches to imaging and therapy, delineates the scientific and technological tools key to the field, and highlights future directions for the specialty. The author wishes to thank Drs. Katrina Korhonen, Austin Pantel, Yin Jie Chen, and Ilya Nasrallah of the University of Pennsylvania for their help with the images for this chapter.